Each year tens of thousands of recently released Israeli soldiers travel abroad — to Central and South America, to south and southeast Asia, to the cheaper parts of Europe — for anywhere from a month to over a year in order to “clean their heads,” as the Hebrew saying goes, after an intense and demanding military service. 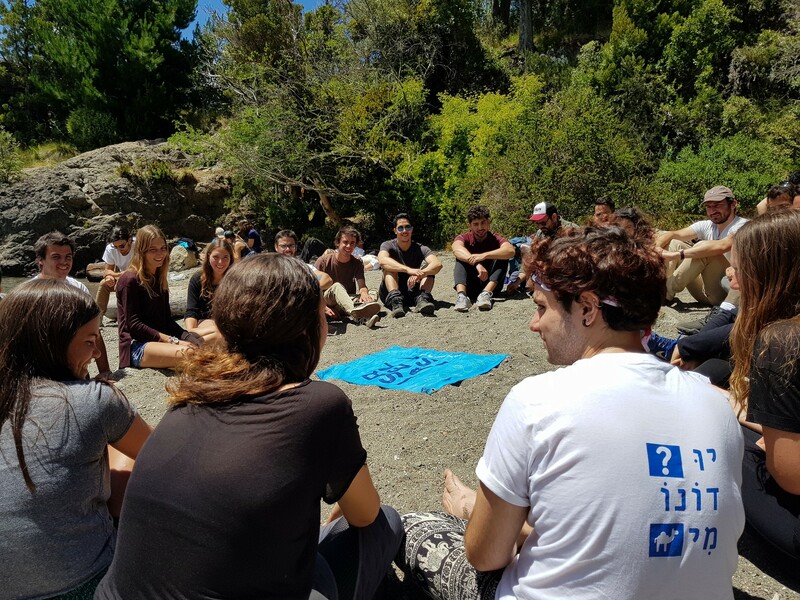 For many young Israelis, these trips are a rite of passage, during which they grow out their hair, learn to manage their own schedules without instructions from parents or commanders and, often for the first time, spend time with non-Israelis, both locals and fellow backpackers, not all of whom necessarily have positive feelings toward the State of Israel or its military. With this in mind, Eyal Biram, a former captain in an elite special forces unit (for security reasons, the name cannot be published), saw an opportunity: These masses of recently released soldiers, bound for the four corners of the world, could be “ambassadors” for Israel. “We understood that Israel has a ‘hasbara’ problem and that the people dealing with it the most are recently released soldiers and they have an opportunity to positively influence how Israel is perceived,” Biram told The Times of Israel. In the minds of Biram and his two partners, Jonathan Svorai and Barak Deri, these backpacking veterans essentially already were representatives of the state, often being the first Israelis that their fellow travelers had ever met, they just weren’t particularly effective ones. “More than 500,000 [Israelis] between the ages of 20 and 24 travel abroad each year. Basically, a group that is mostly made up of recently released soldiers. If you know how to give them a boost, you could bring about a real change. This is clear. Each of them is basically an informal Israeli ambassador, for good and for bad,” Biram said. So Biram, Svorai and Deri came up with Israel-is, a project designed to give soon-to-be-released soldiers some basic tools for speaking about Israel and their military service. “The idea is that the strength of these people is their authenticity, that it’s their story. They don’t need a degree in anything. They just need their story,” Biram said. 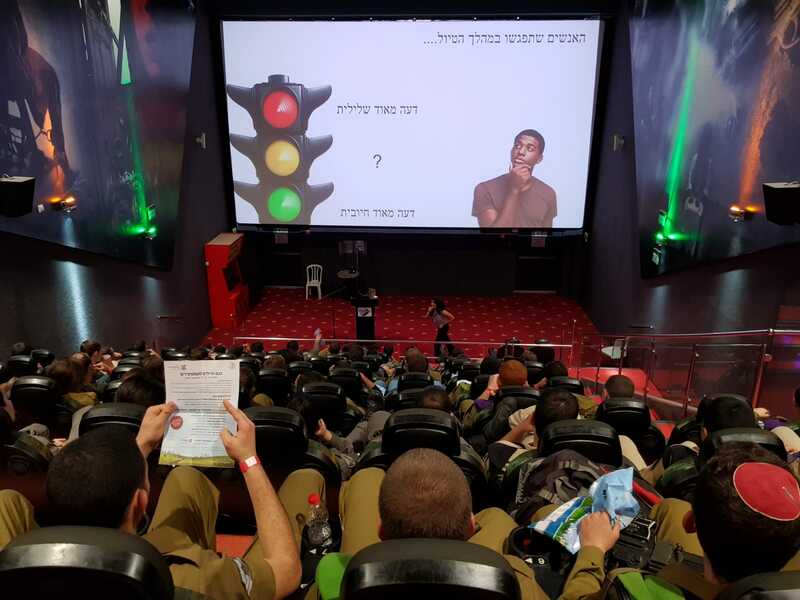 This program is mandatory for nearly all IDF soldiers as part of a pre-release event, known in Hebrew as a Kenes Mishtachrerim, in which they are also taught about the funds and other government benefits available to new veterans. During these Israel-is events, soldiers are also given basic traveling tips and advice on how to be a better tourist. 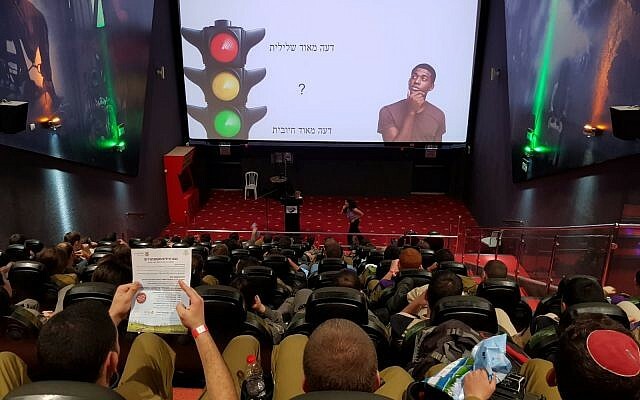 Tens of thousands of soldiers have already passed through the most basic version of Israel-is at these pre-release events, which run about half an hour, and thousands more have taken part in its more advanced optional day-long courses, Biram said. Israel-is has also created a collection of videos and infographics about Israel and its conflict with the Palestinians. The information for this material comes from official government sources, namely the Foreign Ministry and Israel Defense Forces, Biram said. For now, the program operates mainly from donations. Indeed, Biram is currently in the United States to meet with Jewish organizations and philanthropists there about receiving financial support from them. The group also works with the Ministry of Strategic Affairs, a borderline clandestine government office dedicated to fighting the boycott, divestment and sanctions efforts against Israel, but does not yet receive a substantial amount of funding from the ministry, though Biram said he hopes it will in the future. Biram insists that the program is apolitical. It is not meant to tell soldiers what to think about Israel, but rather how to better express their beliefs, Biram said. “Our workshops are not political. They are meant to teach how to take your personal story in order to get across a message. It doesn’t matter if you’re right, left, support, oppose, whatever,” he said. 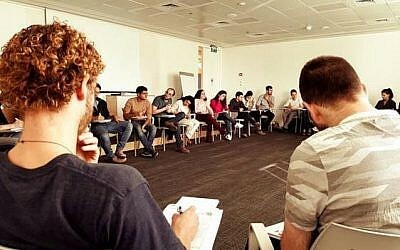 The Times of Israel sat on one of Israel-is advanced workshops, where about two dozen men and women in their early 20s were learning how to respond when, for instance, someone asks them, “Why is Israel killing Palestinian protesters in Gaza?” — referring to the approximately 200 people killed by Israeli troops during riots along the border over the past year. This training curriculum was crafted for them by an Israeli communications firm called Debate, which also works with a number of government ministries, universities and large companies. 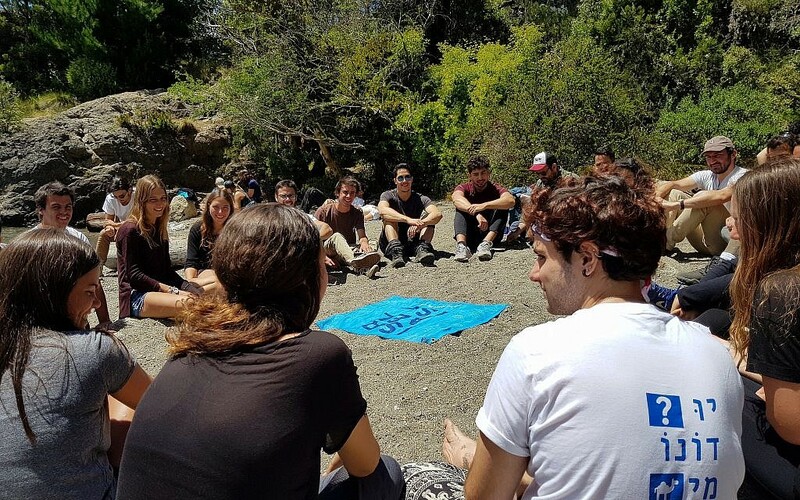 The goal of the training does not appear to be teaching these young people how to win an argument about Israel, but how to avoid having an argument altogether. By the end of the conversation, they still might not like the State of Israel and what it does, but they will hopefully like the Israeli they were speaking to. The first step, the instructor told them, is to thank them for the question and mean it. “It’s not their fault that they’ve only heard bad things about Israel,” he said. They should then seek to answer the question by drawing on their own experiences and beliefs, the instructor said. One of the participants, who had served as a combat soldier on the border, said he would describe what he saw during the clashes along the security fence. Another said she would talk about the safety concerns of the Israeli communities closest to the Gaza Strip. The instructor encouraged them to always end these conversations on a positive note, even if it that means “agreeing to disagree,” and with plans to continue speaking. For the majority of soldiers, the program is designed to help them respond when confronted by questions about Israel during their travels. 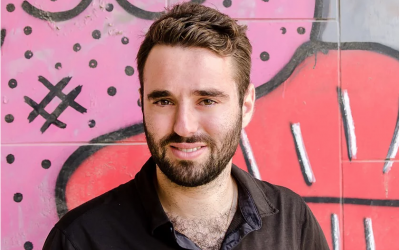 But Israel-is also runs programs and initiatives around the world that encourage backpackers to actively reach out to locals and tourists to speak with them about Israel, rather than more passively waiting for these conversations to naturally arise, Biram said. 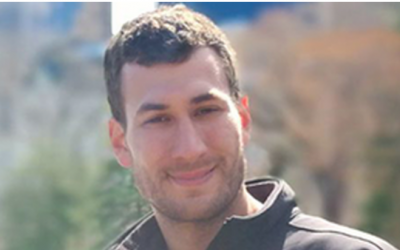 For example, Bank Leumi partnered with Israel-is for an initiative in which participants are reimbursed for meals at a restaurant or drinks at a bar if they bring along another traveler to speak about Israel, and upload a short video of the encounter. The group also organizes meet-ups and other activities around the world. Israel-is was born on a flight to Uganda from Israel in 2016, when Biram was traveling with Prime Minister Benjamin Netanyahu for the 40th anniversary of the Israeli military’s daring raid on Entebbe. Biram had been thinking of his own recent travels through the Philippines a few months prior and conversations he had with people there about Israel. So he borrowed a few pieces of paper and set to work crafting a plan. With the connections that Biram, Svorai and Deri had through the elite unit in which they served, they were able to quickly schedule meetings with then-IDF deputy chief of staff Yair Golan, former IDF chief of staff Shaul Mofaz and other senior military officials. They initially envisioned the project as an internal military program though the IDF Education Corps, but quickly realized that this was a dead-end. “We met with the IDF chief education officer and presented him our plan for how the military could train every soldier before they were released. We determined two things: one, that a program like this must exist, and two, that the Education Corps cannot be responsible for it,” Biram said. This was in part due to budgetary constraints and to keep the military from appearing political, he said. They also considered teaming up with an existing hasbara organization but ultimately decided against it because of the negative connotations that the term has developed, Biram said. “Hasbara is a term that pushes people away. We want to be a nation-wide organization. There aren’t many groups that everyone can agree with,” he said. Biram, Svorai and Deri also feared that creating the program within an existing hasbara group could make it more difficult for them to partner with the military, as most of these organizations have the appearance of leaning one way or another politically. “The army’s not going to let in a group that has even a suspicion of politics. We needed to have a group that’s clean as the driven snow, something we can keep apolitical, which presents the views of the average Israeli,” Biram said. So instead they formed Israel-is as an independent organization, which works with — but is not part of — the military. Israel-is currently operates with only four full-time employees, all under the age of 27. The rest of the work is performed by contractors and volunteers. The group also receives a good deal of support from former and current Israeli civil servants on a pro bono basis, including former Israeli ambassador to the United Nations Ron Prosor, former IDF spokesperson Lt. Col. (res.) Peter Lerner, the former head of the IDF Manpower Directorate Maj. Gen. (res.) Hagai Topolanski and others. Their plan is to continue expanding, to training not only soon-to-be-released IDF soldiers, but also those who perform national service instead of serving in the military, students in universities and young Israelis about to work as camp counselors in the US, Biram said.